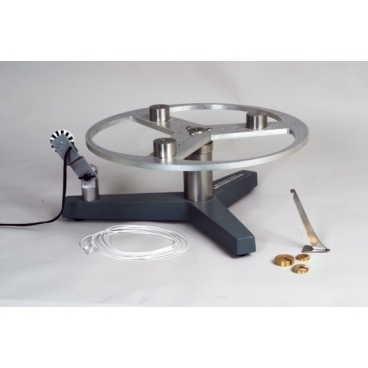 This is designed to provide a simple, clean means of studying rotational dynamics. A 40 cm diameter disk is machined from an aluminum plate with provision made to locate three masses at any of seven radii. The three masses screw into threaded holes in the frame so they can be repositioned with great accuracy. The moment of inertia can be varied through a wide range. The simple geometry makes calculating the moment of inertia of the masses easy, so that the calculated values can be veriﬁed by experiment. Measuring the effect of friction. Rotational torque is provided by a mass attached to a light cord passing over a pulley and wrapped around the hub. Since its mass is only 50 grams, disk acceleration is very slow - almost 15 seconds being required for the mass to fall a meter. This permits good, accurate, reproducible measurements using only a meter stick, a stop watch, and balance. An EC-42 Digital Pulley can be used to send data for computer analysis using the Daedalon EC-41 Computer Interface.